This e-learning resource for Safeguarding Children and Young People is an important and timely project to support the work of all healthcare staff. Delivered by Health Education England e-Learning for Healthcare (HEE e-LfH) in partnership with the Royal College of Paediatrics and Child Health (RCPCH), the e-learning aims to meet statutory training requirements so that healthcare providers can ensure their teams are up-to-date with the issues surrounding Child Protection. Level 3 – for clinical staff working with children, young people and/or their parents/carers as described in the Intercollegiate Document – Safeguarding Children and Young People: Roles and Competences for Health Care Staff 2014. All health professionals have a key role to play in safeguarding children and young people. Section 11 of the Children Act places a statutory duty on key people and bodies to make arrangements to safeguard and promote the welfare of those they come into contact with. These e-learning modules offer a clear and effective solution to achieve this aim and meet the National Workforce Competences. The modules are broken down into short 30 minute learning sessions and are easily available to all learners whether at work or at home. This session is for non-clinical staff working in health care settings: receptionists, administrative, catering, transport and maintenance staff for example. A highly engaging and interactive session of about 30 minutes. It has both a pre-assessment to tease out your current knowledge and a post self-assessment to help you gauge your learning. Data from the assessments is not captured and you are free to re-visit and revise where necessary. Level 2 – Safeguarding Children and Young People covers the three Rs: Recognition, Response and Recording. Consisting of three 30 minute e-learning sessions and developed for all clinical staff who have some degree of contact with children and young people and/or parents/carers, the sessions will teach you how to manage concerns that a child is being maltreated. Staff requiring this training include: healthcare students, clinical laboratory staff, pharmacists, ambulance staff, dentists, dental care practitioners, audiologists, opticians, adult physicians, surgeons, anaesthetists, radiologists, nurses working in adult acute/community services (including practice nurses), allied health care practitioners and all other adult orientated secondary care healthcare professionals, including technicians. The three Level 2 e-learning sessions will provide you with enough information to demonstrate competency in accordance with the majority of requirements outlined in the intercollegiate safeguarding competences. However, it should be noted that professionals are also expected to keep abreast of key statutory and non-statutory guidance and legislation. Further, professionals should also support this e-learning with regular clinical updating, clinical audit, reviews of significant events and peer discussions and take part in multidisciplinary training where possible. 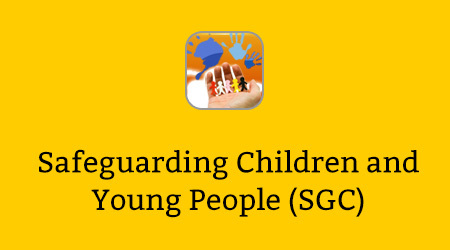 Safeguarding Children and Young People covers a wide range of topics including sudden or unexpected death in childhood, parental risk factors, unexplained injuries, disability and neglect, fabricated and induced illness and adolescents presenting with intoxication. These seven sessions have been created for all clinical staff working with children, young people and/or their parents/carers and who could potentially contribute to assessing, planning, intervening and evaluating the needs of a child or young person and parenting capacity where there are safeguarding/child protection concerns. Staff requiring this training include GPs, forensic physicians, urgent and unscheduled care staff, mental health staff (adult and CAMHS), child psychologists, child psychotherapists, adult learning disability staff, learning disability nurses, health professionals working in substance misuse services, youth offending team staff, paediatric allied health professionals, sexual health staff, school nurses, health visitors, all children’s nurses, midwives, child psychologists, obstetricians, all paediatricians, paediatric radiologists, paediatric surgeons, children’s/paediatric anaesthetists, paediatric intensivists and paediatric dentists. The seven Level 3 e-learning sessions will provide you with information that will help to demonstrate competency in accordance with the majority of requirements outlined in the intercollegiate safeguarding competences although it is not exhaustive. It should be noted that professionals are also expected to keep abreast of key statutory and non-statutory guidance and legislation. Further, professionals should also support this e-learning with regular clinical updating, clinical audit, reviews of significant events and peer discussions and take part in multidisciplinary training where possible. Many of the required competences at this level can only be obtained through clinical practice and experience and you should consult Safeguarding Children and Young People: Roles and Competences for Health Care Staff 2014 to ensure you are attaining all of the required competences you need in your particular job at this level. If you already have an account with e-LfH, then you can enrol on to the Safeguarding Children and Young People programme by logging in to the e-LfH Hub, selecting My Account > Enrolment and selecting the programme. You can then access the programme immediately in the My e-Learning section. If you do not have access to any of the programmes listed above please log in to the e-LfH Hub using your existing username and password and select which programmes you would like to access. View this help page for more information. The Safeguarding Children and Young People programme is also available to NHS healthcare staff via the Electronic Staff Record (ESR). Accessing this e-Learning via ESR means that your completions will transfer with you throughout your NHS career. In the event that you do not qualify for free access to the Safeguarding Children and Young People programme, you are able to license access through eIntegrity, a community-interest company established for this purpose. For more information on the licensing options available for the Safeguarding Children and Young People programme, please visit the eIntegrity website.